Perch Furniture shares easy decorating ideas from gorgeous Portland homes. 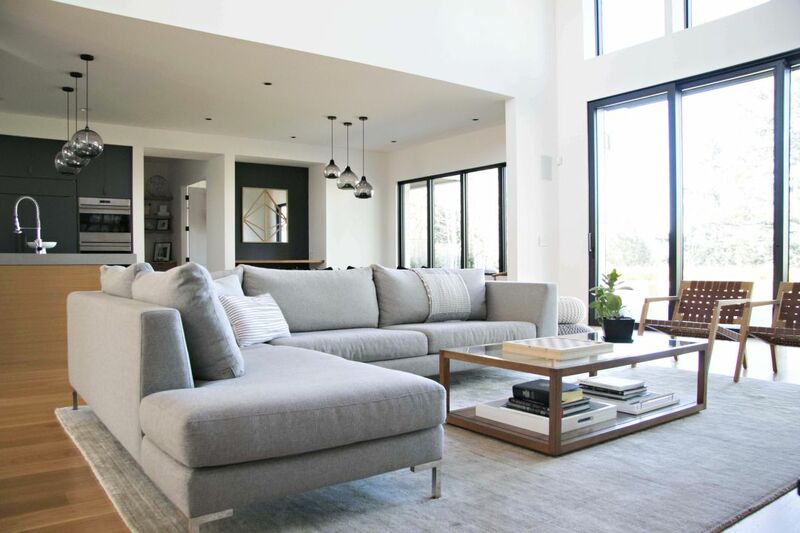 A custom Verona sectional by Perch Furniture defines this airy living room designed by Courtney Nye. “I just want my house to look like grownups live here,” a client recently told Willi Galloway—who owns Perch Furniture in the Pearl with her husband, Jonathan. As the parents of a young son, and the owners of a lazy yellow lab, the Galloways get it. Life happens on a couch. That’s why they are committed to helping people create furniture that is designed just for them. Perch specializes in custom upholstered furniture—clients get to choose the exact size of their couch (to the inch! ), the firmness of the cushions, the fabric or leather, and all the little details like buttons and leg style. 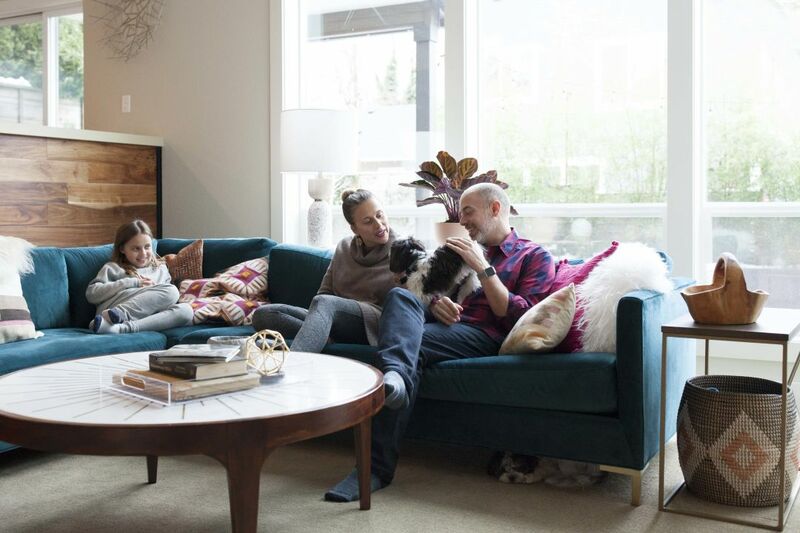 Perch has designed couches, sectionals, chairs and beds for thousands of Portlanders and today they are sharing their tips for creating a living room you are excited to come home to. 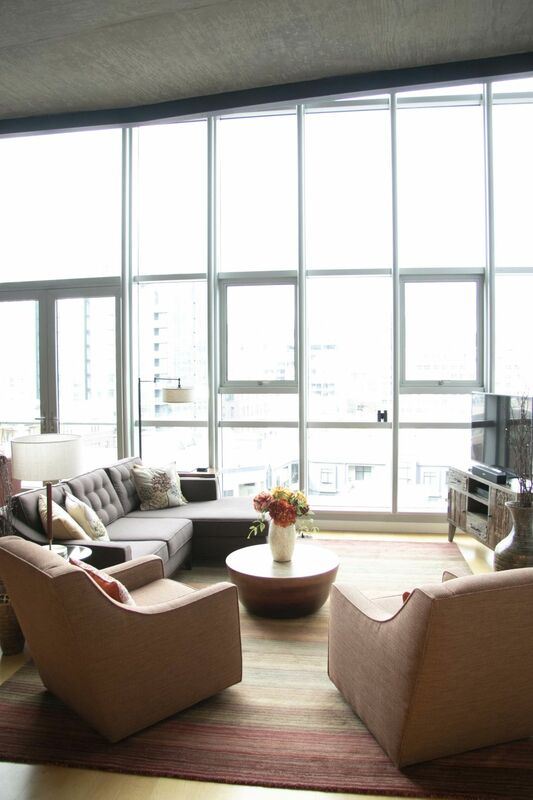 A custom Charlie sectional from Perch Furniture in a room designed by Interior Design Alchemy. Start by thinking about how you want to use your couch—and who will sit on it. Do you like to eat on the couch? Does your sofa double as a playroom? Do you have a cat that likes to scratch? Making a smart fabric or leather decision now has a big impact on how your couch will look in five years. 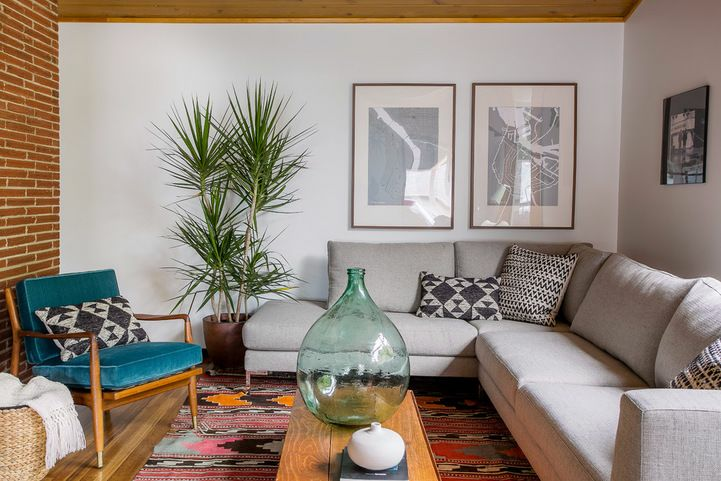 Designer Kristen Siefkin of Interior Design Alchemy transformed a corner of this SW Portland living room into a comfy nook by placing a custom teal velvet Charlie sectional from Perch Furniture in the space. The bright, playful fabric also happens to be extremely durable and easy-to-clean—important characteristics for a couch that plays host to the family’s two girls and a pair of adorable dogs. A Verona sectional from Perch Furniture creates a cozy corner in a space by Annie Wise Design. Furniture that sits up off the ground on legs takes up less visual space than furniture with short block or bun-style legs. 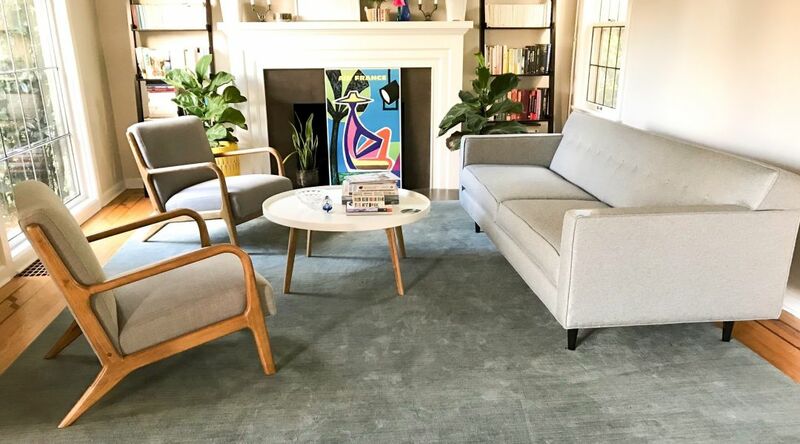 In this mid-century living room, designer Annie Wise created a cozy sitting area by pairing a neutral Verona sectional from Perch with a colorful, flat weave rug. The sectional provides plenty of space for seating and the style’s low profile helps enclose the space without dominating it. Perch created a modular sectional to fit down a tight basement staircase. This cozy media room is located at the bottom of a narrow, steep staircase. How do you make an expansive couch for a room with tight space restrictions? Break it into pieces! Perch created a modular Hoyt sectional that is big enough for movie nights, but small enough to fit down the stairs. 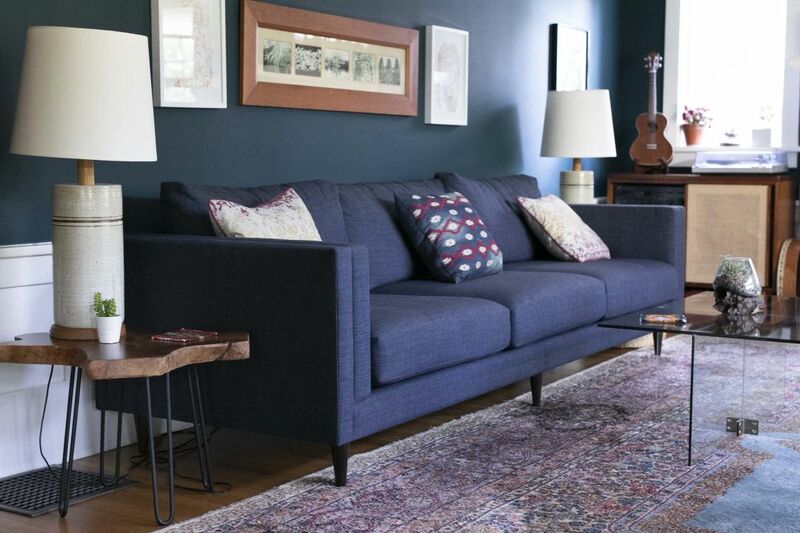 A blue Hoyt sofa from Perch blends into the monochromatic color scheme designed by Trish Grantham. It may seem counter intuitive, but painting a small room a dark color creates intimacy and an opportunity to lighten things up with accents. In this long, narrow Alameda Ridge living room, Perch Furniture’s resident color expert, designer Trish Grantham, chose a deep blue for the walls and the fabric on the Hoyt sofa. The monochromatic palette allows the family’s heirloom rug and accessories to shine. A Sterling sofa from Perch Furniture has a midcentury vibe. A matched set of furniture can make rooms look boxy and crowded. 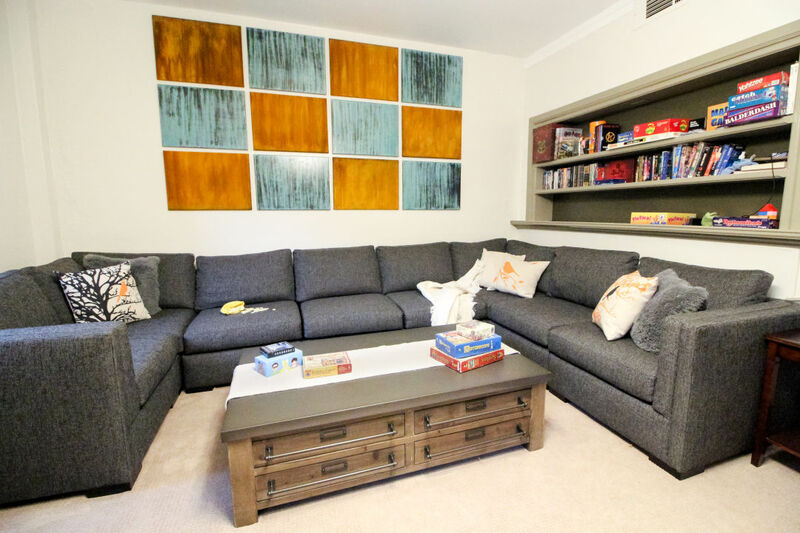 In this living room, Perch’s client created a comfy conversation area by mixing together different furniture with a cohesive mid-century style. She paired a Sterling sofa with a couple of wood chairs, providing seating for 6. The chairs petite stature and open, sculptural arms let more of the room peek through. A Lawson sofa and a pair of custom swivel chairs from Perch Furniture define the living room of this Pearl District loft. Living spaces with an open format present their own, unique challenges: they are heavily used, food often finds their way on to furniture, and it can be hard to make a big space feel cozy and connected. In this Pearl District loft, Perch’s client chose a Lawson sofa chaise sectional to divide the living room from the dining area. The open ended chaise provides a comfy place to work on a laptop without blocking the floor to ceiling windows. Custom swivel chairs from Perch allow guests to enjoy the view or turn around and chat with their hosts in the kitchen. To see full tours of the homes featured in this article, visit Perch Furniture’s Blog.